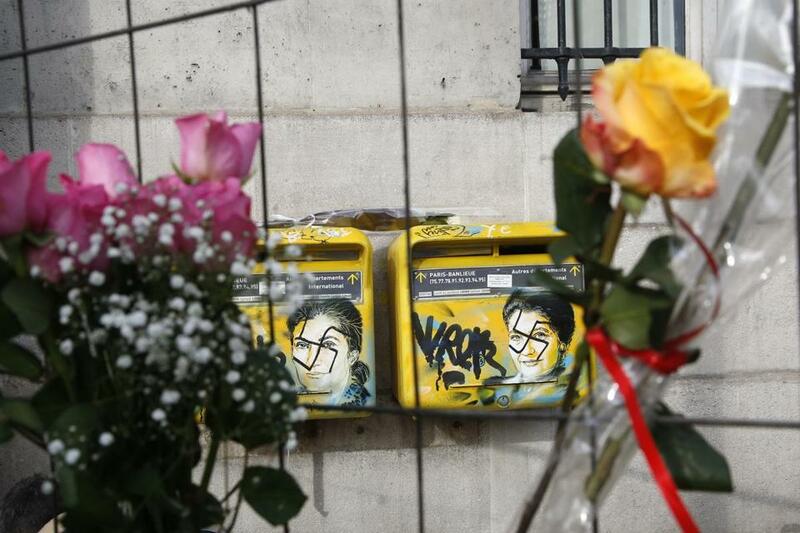 Roses were placed next to vandalized mailboxes with swastikas covering the face of the late Holocaust survivor and renowned French politician Simone Veil before their renovation in Paris on Tuesday. PARIS — Portraits of a Holocaust survivor stained with swastikas. A memorial in honor of a Jewish man vandalized. A bagel shop with the German word ‘‘Juden’’ sprayed on its front window. A judicial official told said that Paris prosecutors have opened four investigations following incidents in the French capital last weekend. The official was not authorized to be publicly named because the investigations are ongoing. ‘‘Anti-Semitism is spreading like a poison, like a venom,’’ Interior Minister Christophe Castaner said while attending a ceremony at the memorial of a young Jewish man who was tortured to death in 2006. Two trees planted at the scene where Ilan Halimi was found dying in a Paris suburb have been vandalized. ‘‘It’s rotting minds, it’s killing,’’ Castaner said at the Monday event, vowing that the government would fight anti-Semitism. Castaner did not link the rise of incidents to any specific groups. Some members of the yellow vest movement are known for extremist views, and several anti-Semitic incidents have occurred amid weekly antigovernment protests that started in November. Frederic Potier, a French government official in charge of fighting anti-Semitism, racism and antigay discrimination, said some far-right groups have managed to infiltrate yellow-vest demonstrations. ‘‘Anti-Semitic tags up to nausea in the heart of Paris this weekend,’’ Potier tweeted with a picture of a wall with a derogatory inscription, insinuating that French President Emmanuel Macron was just a tool of a supposed Jewish plot. ‘‘When the hatred of the Jews overlaps with the hatred of democracy, the vocabulary of the fachosphere (the sphere of fascists) is found on the walls,’’ Potier wrote. In a separate incident, one of the founders of bagel chain Bagelstein said the word ‘‘Juden’’ was painted on the window of one of the company’s restaurants in Paris. He said the graffiti was found before the yellow vest demonstrations that took place Saturday. Concerns that anti-Semitism might be growing in France predated the protests that were started in the fall to oppose fuel tax increases. In a speech to a leading Jewish group last year, Macron pledged to protect France’s Jews.